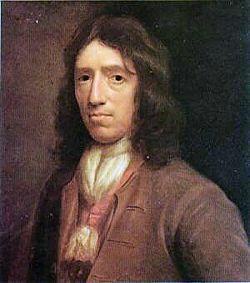 William Dampier (baptised September 5, 1651 – died March 1715) was an English buccaneer, sea captain, author and scientific observer. He was the first Englishman to explore or map parts of New Holland (Australia) and New Guinea. He was the first person to circumnavigate the world twice, and went on to complete a third circumnavigation. His observations of natural history influenced Charles Darwin, among others. His navigational skills and exploratory voyages extended imperial and commercial interests around the globe and eventually led to the colonization of Australia. Dampier's life belongs to the great age of so-called "Discovery," that is, when Europeans discovered or re-discovered parts of the world of which they were ignorant at that time. It was also a time of adventure and of the advancement of learning. New confidence in human ability to unravel the mysteries of life and of the planet motivated both these "discoveries" and the accumulation of information and data about what was observed both in the natural and human worlds. Dampier, for all his faults (he was Court Martialled for cruelty) contributed copiously to the accumulation of cultural and of scientific knowledge. 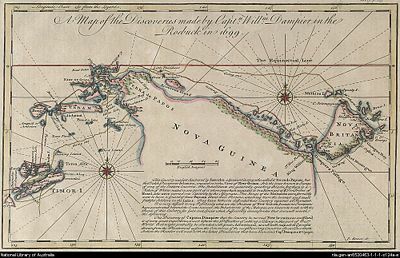 Map from "A New Voyage Round the World," published in 1697 by William Dampier, the English sea captain, naturalist, and occasional pirate. The Miskito coast is marked with a star. Dampier and his associate, the surgeon and buccaneer Lionel Wafer describe the Miskito peoples in the period 1690-1700. These tribal groups, often mixed with runaway slaves, formed a distinct culture in the coastal region, sometimes forming alliances with pirates against Spanish authorities in the sixteenth-eighteenth centuries. In the 1670s, he crewed with buccaneers on the Spanish Main of Central America, twice visiting the Bay of Campeche. This led to his first circumnavigation: in 1679 he accompanied a raid across the Isthmus of Darién in Panama and captured Spanish ships on the Pacific coast of that isthmus; the pirates then raided Spanish settlements in Peru before returning to the Caribbean. Dampier made his way to Virginia, where in 1683 he engaged with the privateer John Cook (or Cooke). Cook entered the Pacific via Cape Horn and spent a year raiding Spanish possessions in Peru, the Galapagos Islands, and Mexico. This expedition collected buccaneers and ships as it went along, at one time having a fleet of ten vessels. In Mexico Cook died, and a new leader, Captain Edward Davis, was elected captain by the crew. Dampier transferred to Captain Charles Swan's ship, the Cygnet, and on March 31, 1686 they set out across the Pacific to raid the East Indies, calling at Guam and Mindanao. Leaving Swan and 36 others behind, the rest of the pirates sailed to Manila, Pulo Condore, China, the Spice Islands, and New Holland, (Australia). Early in 1688, Cygnet was beached on the northwest coast of Australia, near King Sound. While the ship was being careened Dampier made notes on the fauna and flora he found there. Later that year, by agreement, he and two shipmates were marooned on one of the Nicobar Islands. They built a small craft and sailed it to Acheen in Sumatra. After further adventures Dampier returned to England in 1691 via the Cape of Good Hope, penniless but in possession of his journals. The publication of these journals as New Voyage Round the World in 1697 created interest at the British Admiralty and in 1699 Dampier was given the command of HMS Roebuck with a commission to explore Australia and New Guinea. The expedition set out on January 14, 1699, and on July 26, 1699 he reached Dirk Hartog Island at the mouth of Shark Bay in Western Australia. In search of water he followed the coast northeast, reaching the Dampier Archipelago and then Roebuck Bay, but finding none he was forced to bear away north for Timor. Then he sailed east and on December 3, 1699 sighted New Guinea, which he passed to the north. Sailing east, he traced the southeastern coasts of New Hanover, New Ireland and New Britain, discovering the Dampier Strait between these islands (now the Bismarck Islands) and New Guinea. On the return voyage to England, Roebuck foundered near Ascension Island on February 21, 1701 and the crew were marooned there for five weeks before being picked up on April 3 by an East Indiaman and returned home in August 1701. Although many papers were lost with the Roebuck, Dampier was able to save many new charts of coastlines, trade winds and currents in the seas around Australia and New Guinea. On his return Dampier was court-martialled for cruelty. On the outward voyage Dampier had crewman George Fisher removed from the ship and jailed in Brazil. Fisher returned to England and complained about his treatment to the Admirality. Dampier wrote an angry vindication of his conduct, but he was found guilty, docked his pay for the voyage, and dismissed from the Royal Navy. He wrote an account of the 1699–1701 expedition, A Voyage to New Holland and returned to privateering. The War of the Spanish Succession broke out in 1701 and English privateers were being readied to assist against French and Spanish interests. Dampier was appointed commander of the 26-gun government ship St George, with a crew of 120 men. They were joined by the 16-gun galleon Cinque Ports (63 men) and sailed on April 30, 1703. En-route they unsuccessfully engaged a French ship but captured three small Spaniard ships and one vessel of 550 tons. However, the expedition was most notable for the events surrounding Alexander Selkirk. The captain of the Cinque Ports, Thomas Stradling fell out with Sailing Master Selkirk. In October 1704 the Cinque Ports had stopped at the uninhabited Juan Fernández Islands off the coast of Chile to resupply. Selkirk had grave concerns about the seaworthiness of Cinque Ports and after a disagreement with Dampier, he opted to remain on the island. Selkirk was to remain marooned for four years and four months and his experiences were to become the inspiration for Daniel Defoe's Robinson Crusoe. Selkirk's misgivings were fully justified: Cinque Ports did later sink with the loss of most of her crew. 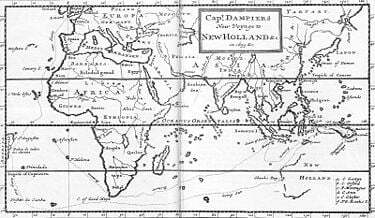 Dampier returned to England in 1707 and in 1709 his A Continuation of a Voyage to New Holland was published. Dampier was engaged in 1708 by the privateer Woodes Rogers as sailing master on the Duke. This voyage was more successful: Selkirk was rescued on February 2, 1709, and the expedition amassed nearly £200,000 of profit. However, Dampier died in London in 1715 before he received his share. Dampier influenced several figures better known than he is, including Charles Darwin and Alexander von Humboldt who drew on his observations and analysis of natural history. Dampier made innovations in navigation technology that were studied by James Cook and Horatio Nelson. Daniel Defoe, author of Robinson Crusoe, was inspired by accounts of real-life castaway Alexander Selkirk, a crew-member on Dampier's voyages. Dampier's reports on breadfruit led to William Bligh's ill-fated voyage in HMS Bounty. He is cited over 1,000 times in the Oxford English Dictionary. His travel journals depicting Panama influenced the undertaking of the ill-fated Darien Scheme, leading to the Act of Union of 1707. His notes on the fauna and flora of southeastern Australia were studied by naturalist and scientist Joseph Banks who made further studies during the first voyage with Cook. It helped lead to the naming of and colonization of Botany Bay and the founding of modern Australia. Wilkinson, Clennell William Dampier. London: John Lane at the Bodley Head, 1929. Works by William Dampier: facsimile scans (originals held by the National Library of Canada). J. Bach, 'Dampier, William (1651 - 1715)', Australian Dictionary of Biography, Volume 1, Melbourne University Press, 1966, pp 277-278. This page was last modified on 25 July 2013, at 19:21.